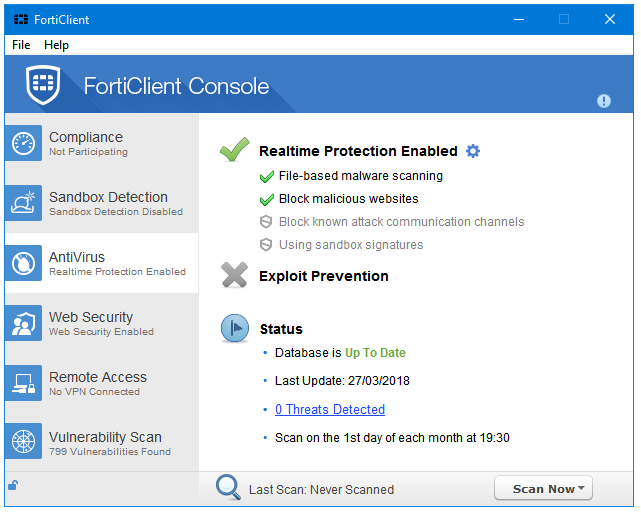 Home » PC » Antivirus & Security » FortiClient Free Antivirus 2019 Review – Industry-Grade Protection for Windows 10. Best Free Antivirus Products for Windows PC in 2019 – FortiClient Free Antivirus. 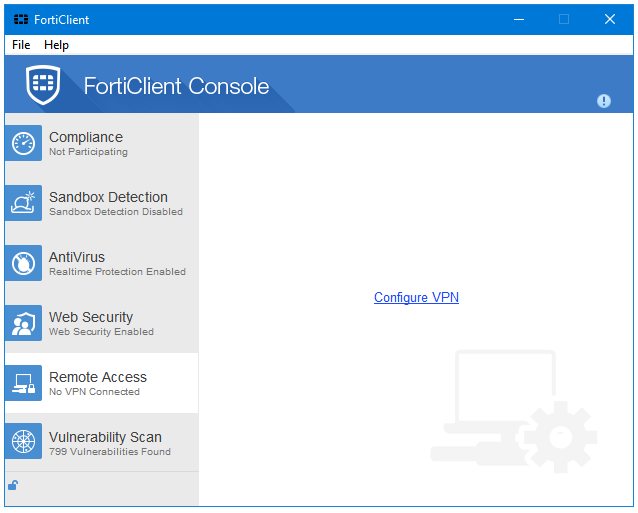 FortiClient is a free antivirus product by Fortinet. Fortinet is known for making network security hardware products. 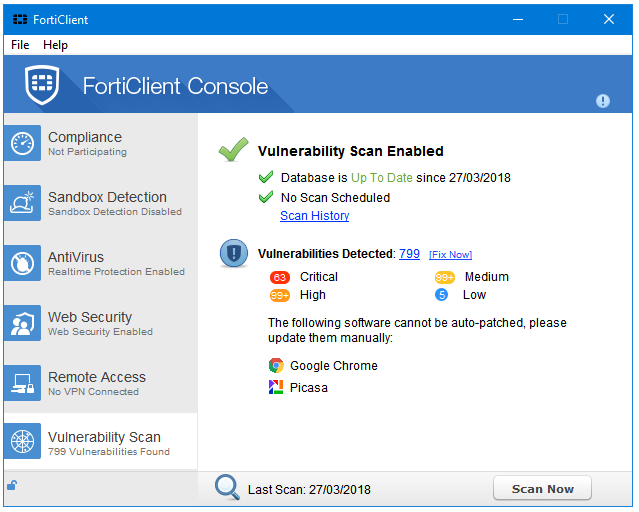 FortiClient is a cross-platform program, available for Windows, macOS, Linux, Windows Phone, iOS, and Android. A very underrated product. It includes Antivirus, Application Firewall, Web Filtering, Anti-Exploit, Vulnerability Scan, SSL-VPN, IPSec VPN, and some other tools. In the December 2018 report of VB100, FortiClient Passed the VB100 test. AV-TEST did not test FortiClient in their most recent test. AV-Comparatives did not test FortiClient in their most recent test. 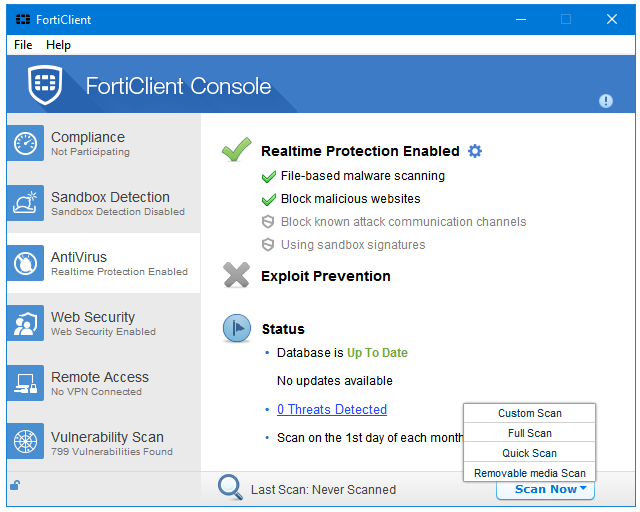 Prior to installing the main program, FortiClient scans the system using its offline scanner tool called FortiClient Virus Cleaner. After FortiClient Virus Cleaner finishes its job, the FortiClient Setup installs FortiClient on the computer. Every feature provided by FortiClient is represented with a dedicated tab in the left-sidebar of the program. Clicking on it opens its settings and details in the right pane of the program window. FortiClient has six side tabs that lists all of the features of this program. 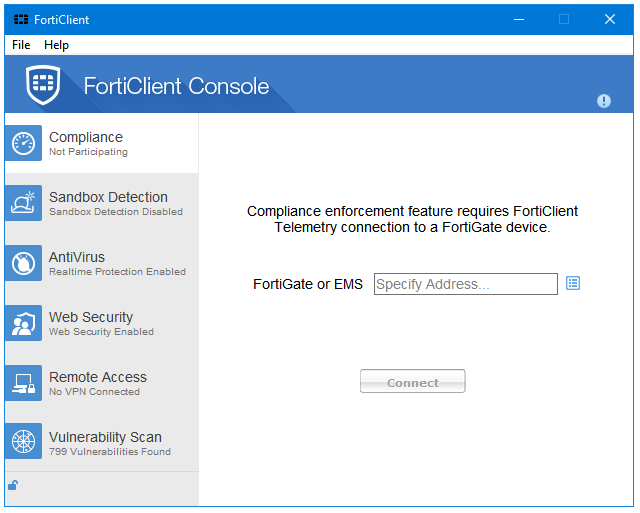 The Compliance section requires Fortinet hardware, the FortiClient Enterprise Management Server (FortiClient EMS) or a FortiGate device to work. Sandbox Detection is another feature that is meant for the Enterprise. 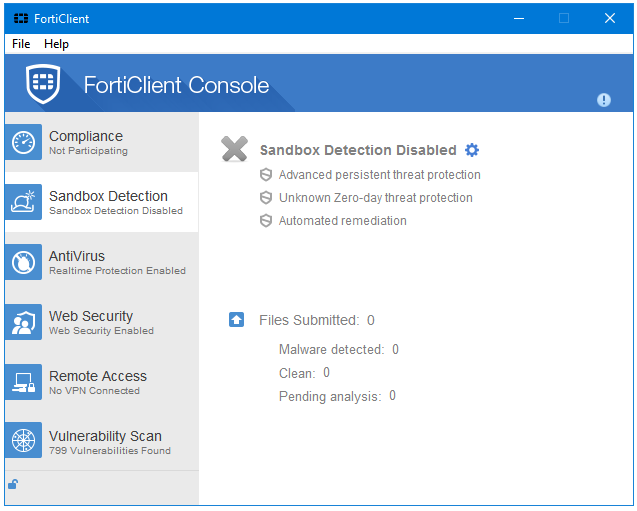 With the help of Sandbox Detection, FortiClient is able to integrate with FortiSandbox, which is another security related technology by Fortinet. You need to enter the Server Address into the Sandbox Detection to enable this feature on your server. Then you can select your preferred settings for various events under the FortiSandbox Submission Options. Remediation Options, and Exceptions options. Antivirus is the main component of FortiClient, one that is used by the both types of users – Home and Commercial. 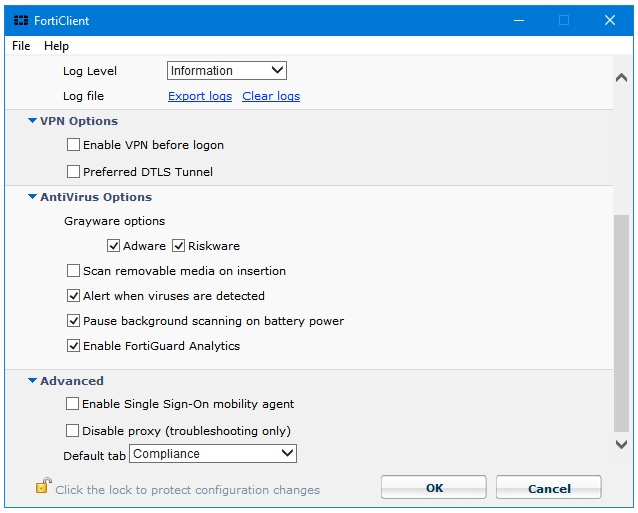 You can check the details of the FortiClient AntiVirus component by clicking on the Settings button placed next to the Realtime Protection Enabled (or Disabled) option. 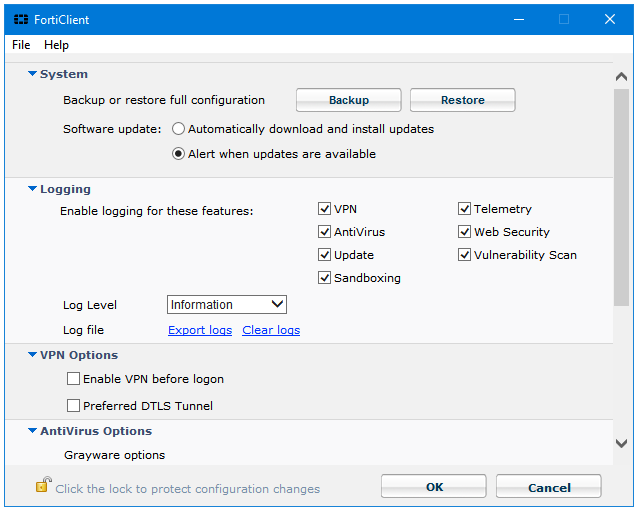 The Status section displays the important information about computer security such as the Database updates, Threat detections, and Scan schedules. Web Security is the most powerful component offered by this software. 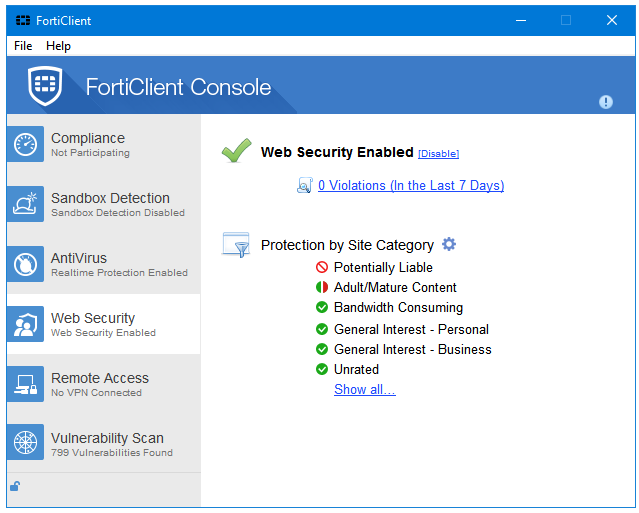 FortiClient brings the Enterprise-grade Web Filtering Firewall to the Home Users for free. Web Filtering is not only a web security feature but also a Parental Control one. Under the Protection by Site Category option, you can specify the category of websites that you want to block on your computer or network under. FortiClient will then blocks all those sites that fall into those categories. FortiClient uses their powerful Enterprise-level Web Filter Database to block harmful websites. Remote Access is a Virtual Private Network (VPN) feature offered by FortiClient. Both types of VPN, SSL-VPN and IPsec VPN, are supported. The Vulnerability Scan tool scans the system for Vulnerabilities, and protects it from any possible Exploits. Click on the Settings option in the File tab of the program menu bar to open FortiClient Settings. The FortiClient Settings are divided into the following five sections. Every major scan type is available in FortiClient. You can run Custom Scan, Full Scan, Quick Scan, and Removable media Scan. 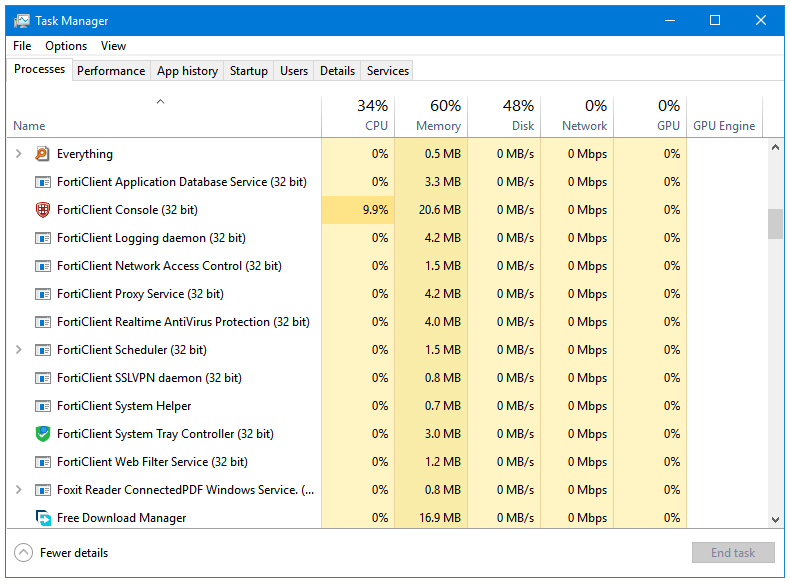 CPU and RAM Usage When Scanning: There is not much impact on the system even when FortiClient is scanning it. It uses only about 60 MB of RAM while performing a full system scan. During Scanning, two processes of FortiClient use the CPU power – av_task and FortiClient Console. 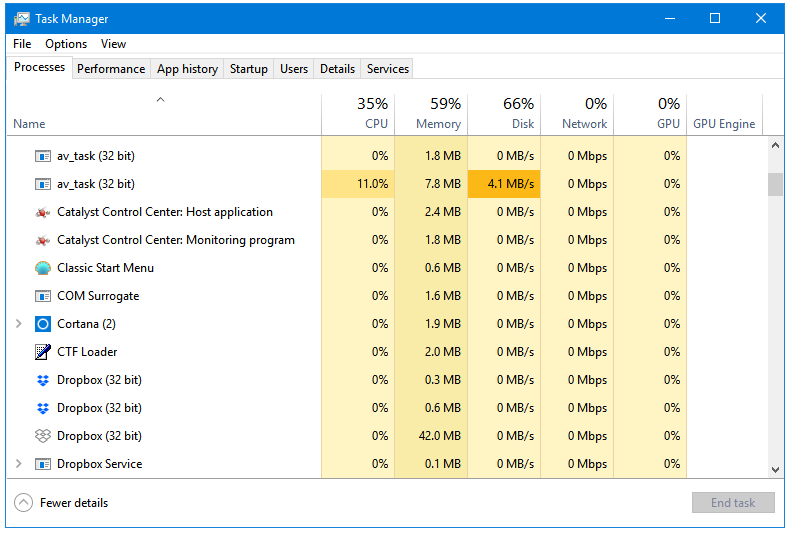 The CPU usage of the av_task process fluctuates between 5 to 15%, and is stable at around 10%, and the CPU usage of the FortiClient Console process fluctuates between 8 to 12%, and is stable at around 10%. 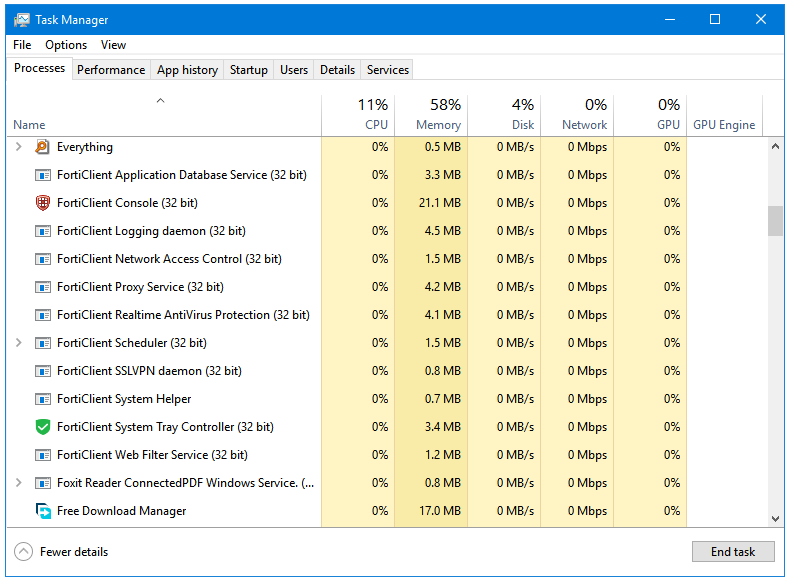 So, a total of about 20% of the CPU power is used continuously while performing a full system scan. The interface is very low-profile. Everything is contained in a small sized program window. FortiClient has six side tabs that represent each of its features. Clicking on each of it opens the settings related to that feature. 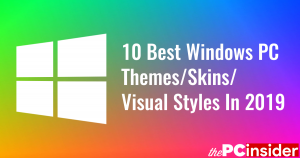 The Sky Blue coloured theme matches well Windows. There is no nag in FortiClient. There is no premium or paid version of the FortiClient Free Antivirus. 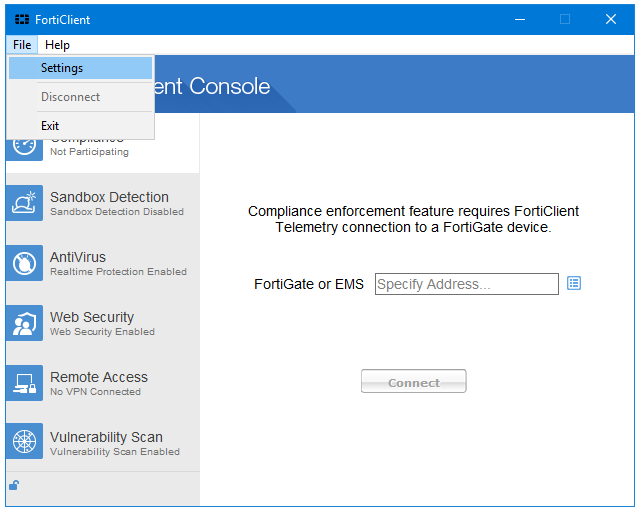 Fortinet, the makers or FortiClient, do not advertise any of their network security hardware products or any other product in FortiClient. I downloaded Forticlient using the link, but my version does not have antivrus and the screen looks completely different. What in the world am I doing wrong? I am *not* a computer person and downloaded this mainly because it was recommended as an alternative to McAfee which I hate. it looks different because recently FortiClient has released a major update to their FortiCliet (from 5.0 to 6.0). The new version has the same technology but new User Interface and Tech Terms. I think what happened is that during the installation you did not check the “Additional Security Features” button. I consider it a design flaw on FortiClient’s side. They have hidden the most important part of an AntiVirus, the AntiVirus component itself, in the “Additional Security Features” section. If you still on FortiClient, then look into the MALWARE PROTECTION and WEB SECURITY sections. The MALWARE PROTECTION section is FortiClient’s Antivirus, and the WEB SECURITY section is FortiClient’s Malicious Website Blocker. These should currently disabled, but you can enable them by going into these sections.